Exactly as the other use who have posted this, my doctor prescribed me sofosbuvir (which I have found a less expensive drug – Novisof rather than Solvadi) to take along with the Ribavarin. The best part of it is that after only 4 weeks of using them both my viral load (after a blood work) showed that it is 0 – my Hep C is not detected which means that I am finally free of this virus. I am having 8 more weeks to take it (finished the first 4 weeks and I have had the blood work not so long ago) and I really hope that it is going to show the same in the end, but I am pretty sure that it will. I’ve been said that I need to finish my 12 weeks course if I don’t want the virus to return back so that’s what I am going to do. especially because it is so easy as I do not have any side effects whatsoever… but in fact I can tell you – I am feeling great. There is absolutely nothing that I can complain about. and I am feeling even more better only by thinking that my virus load is not detectable. 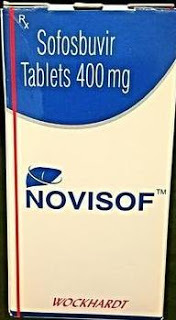 I have taken novisof (which is the generic version of the Solvadi) along with ribavirin as my doctor has prescribed to me and I need to say that this combo is purely amazing which is why I can recommend it to absolutely everyone who is having Hepatitis C like I did (as I don’t have it no more). I have taken the medications for 3 months and I did not experienced any side effects at all except for the fact that I was getting a little bit of drowsiness only. I can tell you people – most of it is all mental. It is true what a lot of doctor say – if you take some pills and you expect that it is going to have side effects then they would have it, that’s for sure. The placebo effect is strong. I have taken the pill as it has been directed by my doctor and I was acting as if they were vitamins and they were acting as if they were vitamins with me (as I said, aside of a bit of drowsiness which is absolutely nothing scary or bad). The hepatitis has been undetectable after only one month of using it and my blood tests have still remained this way since then. I really consider that I am very fortunate that I have found out about this medicine (especially because I have paid less for it since the generics costs less). that’s the reason why I am here. I try to help others and make you understand that in case you suffer from Hep C then go after it and it is going to help you. I can recommend it to everybody who really wants to use this medication for Hep C to really do so and stop thinking whether it is going to be helpful for not because most likely – it will. There are no reasons for you not to do it because as I said – I did not had any side effects and it did the job that it should have done and all of it for fewer $. I wish you all good luck and I hope that you would benefit from it as much as I did.